Swarming is a natural and necessary behavior of colony reproduction for honey bees, and much is still not well understood about the complex behaviors involved.Most people are fearful at the sight of a honey bee swarm, but the truth is that swarms are usually very gentle.Swarming is not a random event, but the timing may be influenced by such factors as weather, day length, genetics, the queen’s age, the queen’s pheromones (especially the distribution of pheromone 9 ODA), and the physical crowding of the hive.Swarms are temporary and not a threat if simply left alone.Most swarming occurs in mid-spring, but swarms may occur in any season. There are multiple outcomes possible following the formation of a swarm.It is the old, established queen that initiates the rearing of a new queen by the workers. (Queens are fully developed females who are fed royal jelly, a protein-rich secretion from glands in the heads of worker bees, their entire larval development period.Worker bees are all female whose reproductive organs are only partially developed and are responsible for all inside-hive duties, except egg laying, and all outside foraging). In the formation of a primary (first) swarm, the old queen may leave the original hive, taking over half of the original workers with her and leaving the original nest to the first daughter queen who will emerge from her developmental queen cell a few days later.There does not seem to be a determining factor to those bees which will go with the swarm and those that will remain behind.The exiting bees join a circular flight and form a cluster a short distance away on a small tree, fence, or other convenient location.Scout bees will search for a new site for the swarm to colonize. Another scenario is for the old queen and the first daughter queen to form swarms, leaving the original hive to a second daughter queen.Even then, several virgin daughter queens may be produced, each forming swarms, and a later emerging queen ultimately inheriting the original nest (1). 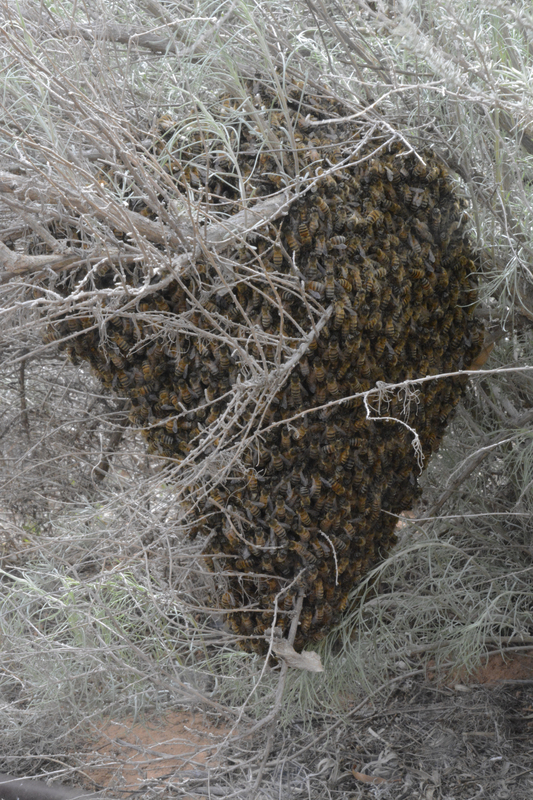 The photograph is the 3rd swarm produced from Sibley’s hive in roughly the same number of weeks. (1). Caron, Dewey M. Honey Bee Biology.Wicwas Press, Kalamazoo, MI (2013).